Historian’s dates differ as to when the Apache or Ndé people entered the Southwestern part of the United States. Some believe the Apaches arrived about the same time as the Spanish explorers did in the 16th century; others think they arrived much earlier. The Apache homelands included the desert areas of Texas, New Mexico, Arizona and northern Mexico. The vast area inhabited by the Apache was known as Apacheria; the Chiricahua Apaches lived in the areas shown on the map below. There are 13 different Apache tribes in the United States today with an approximate population of 57,000. There are five Apache tribes living in Arizona on three different reservations – the Tonto Apache Reservation, the White Mountain Apache Reservation and the San Carlos Apache Reservation. Apaches can choose to live on or off their reservations, of course. Today they live in houses and apartments like most Americans. In the past, Apaches were a nomadic people, meaning they moved about frequently. Because of this, they built simple shelters that could be constructed quickly. Women were in charge of building small wickiups – teepee-like structures – made of wooden tree frames with a matting of brush or thatched grasses covering the frame. The circular or oval wickiups were about 8 to 12 feet in diameter and 6 to 9 feet tall. Typically, they didn’t spend much time in their wickiups because they were intended mainly for sleeping and storage. Possessions might have included a few kitchen tools – pans for cooking as well as baskets for gathering and storage and eating utensils. Apache men were hunters; they hunted buffalo, deer, antelope, rabbits and other small game. They didn’t eat bear, fish, frogs, snakes or pork, but considered horses, mules and cattle (beef) as the choicest meats. Women were gatherers of food – nuts, fruits, beans, seeds, and various cacti – and in charge of the home and children. Some Apache bands did grow corn, beans, melons and pumpkins; often they traded for the crops or sometimes raided others’ food supplies to obtain them. Female Apache artists created beautiful basketry made of yucca or willow leaves and beautiful beadwork on clothing, footwear and other types of materials. In the 1800s, Apaches adopted the clothing of neighboring peoples. The men wore cotton tunics and cotton pants with a breechcloth tied at the waist that hung almost to their knees and a headband tied around their shoulder-length hair. They also wore high deerskin boots or moccasins and shell jewelry; choker-style necklaces and ear-pendants were popular. 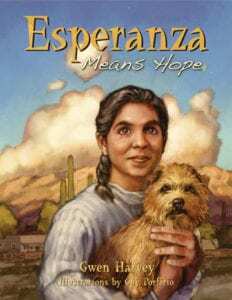 (Read a description of Carlos and his appearance on page 101 in Esperanza Mans Hope.) Women wore short cotton skirts or buckskin dresses decorated with beading. They too, prized shell jewelry. Later, women wore calico dresses and skirts. Today, Apaches only wear their traditional clothing on special occasions. All Apache children learned to ride horses and shoot arrows and boys enjoyed going fishing and hunting with their fathers. (Read p. 154 – 155 for a description of Carlos’ childhood with the Apaches.) Children had dolls and other toys (marbles). They competed in foot and horse races, wrestled, shot rocks with slings, played archery and games of jumping, tossing and hide-and-seek. Of course, there was also storytelling, dancing, and music as part of their cultural upbringing. Ussen (or Usen), the Creator god or Life Giver, was an important deity. The Apache, like most cultures, told a creation and flood story. There were four sacred colors attached to the creation story – black, blue, yellow, and white – that guided the Apaches in their prayer to the Creator. The four colors symbolized the colors of the threads Tarantula used to pull and stretch the earth. During creation, the Creator made the gods, heavens, earth, plants, and animals all from his sweat. Apaches also commonly believe that spirits live within certain mountains and other underground places. Part of the Apache creation story introduces the belief that they are the blood relatives of the mountains, trees, rocks, and the wind. Dzil Nchaa Si An (Mt. Graham) is known to this day as the home of the Ga’an or Mountain Spirits. The Chiricahua Apaches whose homelands included the Cochise County area of Arizona, New Mexico and northern Mexico were involved in the Apache Wars central to Esperanza’s story. Two leaders, Cochise and Geronimo, were important historical players in the interactions between the Apaches, Mexicans and Anglos. Cochise was a chief of the Chokonen band of Chiricahua and Geronimo was a fierce warrior of the Bedonkohe band of the Chiricahua; both are known for their resistance against the U.S. military. Apache children played games that kept them physically fit with a keen mental awareness. Archery was an important competition sport, as the bow and arrow was their main weapon. Apache kids also played toe and toss games to develop coordination, balance, and strength. They ran up mountain trails for fitness every day and were skilled in running long distances. Toe Toss Stick: To play this game, a stick is needed. To set up play, make a mark on the ground with the stick. Then stand behind the mark and balance the stick on your toe. The object is to toss the stick as high as you can and have it land on the mark. Points for height and for accuracy are awarded. Foot Toss Ball: To play this game, a stone is needed. To set up play, balance the stone on your toes. This game had a choice. Players could see how far each player could toss the stone or how high each could toss the stone with their toes. Kids used light stones, adults used heavy stones, and they completed with each other. Kah: Two teams play a game that is sort of like hide-and-seek. While one team is singing, the other team hides a bone in a one of four moccasins that are partially buried in the ground. If the singing team guesses which moccasin the bone is in, the team wins a point and gets to sing and search again. When the singing team guesses incorrectly, the hiding team gets to take their turn to sing and search. The team with the most points, counted using sticks, wins the game. on the hoop. Scores are determined by the positions of the poles with respect to the ring. They camped in the mountains near Humpback’s place, and after dark they made a careful inspection of his buffalo enclosure. The stonewalls were too high to climb, and the only entrance was through the back door of Humpback’s house. Long, long ago, animals and trees talked with each other, but there was no fire at that time.Fox was most clever and he tried to think of a way to create fire for the world. One day, he decided to visit the Geese, te-tl, whose cry he wished to learn how to imitate. They promised to teach him if he would fly with them. So they contrived a way to attach wings to Fox, but cautioned him never to open his eyes while flying. Whenever the Geese arose in flight, Fox also flew along with them to practice their cry. On one such adventure, darkness descended suddenly as they flew over the village of the fireflies, ko-na- tcic-a. In midflight, the glare from the flickering fireflies caused Fox to forget and he opened his eyes–instantly his wings collapsed! His fall was uncontrollable. He landed within the walled area of the firefly village, where a fire constantly burned in the center. They all agreed that would be fun and helped to gather wood to build up a greater fire. Secretly, Fox tied a piece of cedar bark to his tail. Then he made a drum – probably the first one ever constructed, and beat it vigorously with a stick for the dancing fireflies. Gradually, he moved closer and closer to the fire. Fox finally tired and gave the burning bark to Hawk, i-tsarl-tsu-i, who carried it to brown Crane, tsi-nes-tso-l. He flew far southward scattering fire sparks everywhere. This is how fire first spread over the earth. Animals, elements, the solar system, and nature are revered by the Apaches. That which is beyond their understanding is always recognized as the supernatural. In the beginning nothing existed–no earth, no sky, no sun, no moon, only darkness was everywhere.Suddenly from the darkness emerged a thin disc, one side yellow and the other side white, appearing suspended in midair. Within the disc sat a small bearded man, Creator, the One Who Lives Above. As if waking from a long nap, he rubbed his eyes and face with both hands. As Elder Brother watched the women grind cornmeal, the wind made some fallen yellow leaves dance in the sunlight. He decided to do something that would capture some of these wonderful things that He saw. He decided that He must make something that everyone could enjoy, that would lift their hearts and spirits. So, He took out His bag of Creation and began to gather some things together. He took some blue from the sky, and some whiteness from the cornmeal. He gathered some spots of sunlight, and the blackness of a beautiful woman’s hair. He took the yellow of the falling leaves, and the green of the pine needles. He gathered the red, the purple, and the orange from the flowers. As He gathered these things, He put them into His bag. And, last, He put the songs of the songbirds in the bag. When He had finished gathering these things together, He called the children together. He told them to open the bag and there would be surprises for them. So they opened the bag, and out flew hundreds of beautiful Butterflies! They were red and gold and black and yellow, blue and green and white. They looked liked flowers, dancing in the wind. They flew all around the gleeful children, and lit on their heads. The hearts of the children and the adults soared. Never before had they seen such wonderful, happy things. They began to sing their songs as they flew. A long time ago the Bluebird’s feathers were a very dull ugly color. It lived near a lake with waters of the most delicate blue that never changed because no stream flowed in or out. All the while, Coyote had been watching the bird. He wanted to jump in and catch it for his dinner, but he was afraid of the blue water. “I went in only four times,” replied the Bluebird. It then taught Coyote the song it had sung. And so Coyote steeled his courage and jumped into the lake. For four mornings he did this, singing the song the Bluebird had taught him, and on the fifth day he turned as blue as the bird. This made Coyote feel very proud. He was so proud to be a blue coyote that when he walked along he looked about on every side to see if anyone was noticing how fine and blue he was. Then he started running along very fast, looking at his shadow to see if it also was blue. He was not watching the road, and presently he ran into a stump so hard that it threw him down upon the ground and he became dust-colored all over. And to this day all coyotes are the color of dusty earth. learn about traveling the Apache Trail. Make a map of the Apache Trail and include specific locations of interest on your map. What did President Roosevelt say about the trail? Read through the directions for playing Apache Games. Then join with another student or students to play each of the games. Explain orally which game you liked best and why. Keep score and explain how you decided the winners. Read Geronimo’s story in his own words. Compare his story autobiography with other versions of his life told from others’ perspectives. Research the Papago (Rosa in the story was Papago) or Tohono O’odham people. Make a six part foldable and include the following information categories about them: homelands, history, foods, shelter, clothing, and famous people. Watch videos about the Apaches from Discovery Education’s collections located at ADE’s Ideal website. Your teacher has a list of the best videos to watch. As you watch the clips write down 10 new things you learned about the Apaches based on the videos. Read the Apache and/or the Papago legends. Draw a picture or series of pictures to illustrate the legends. Understand and respect the practice of Native Americans only telling certain stories at a particular time of the year or for a specific ceremony or celebration. Learn more about Native American medicines and which plants they used to heal. The “shaman” also used special ceremonies to heal. Find and re-read the pages in the book Carlos and others used native plants to heal. Share what you learned in a poster or PowerPoint show. Use the beadwork generator to make a colorful sampler of beadwork. Print a colored copy and post it. Watch the slideshow about how to build a wickiup. Can you make a small model of it using the steps shown?